First, a question from Nick who asks: I do have a general question...I'm in my last year of law school in California, any insight on American lawyers finding jobs in Ireland? Anyway, thanks for the blog and keep up the good work. Tom says: Ummmm...short answer to your short question is: unlikely. But that's just because I'm not a lawyer (I do know a couple of lawyer jokes, but that's not going to help at all! ), and so don't have a handle on what's truly required. In my ignorance of all things 'law related' I'd suggest that you simply Google "lawyer/jobs/ireland' and see what happens. I just did it, and a whole lot of links came up. Mind you, I have no idea what they really mean! Do remember, however, that a whole lot of US companies have offices and service centres in this country. 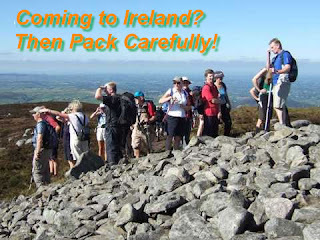 (Go to http://www.idaireland.com/search-companies.xml for a list of ALL 'foreign' countries based in Ireland). I suspect that each of those US companies employs somebody or other regarding their corporate legal affairs, and the interplay between the US and Irish corporate bodies. Anyway, you might start there. My first 'real' job here was with a division of Hyster, the fork lift company. I weasled my way into their marketing department. If I can do it so can you. "My question is this... what sort of advice would you offer someone like me, as far as what to bring, what not to bring, etc. We will be renting a furnished place, so we are planning on packing very minimally. I have been informed that my wife shouldn't have any issues working since she is married to an Irish citizen. Do you know any info on this? I know we have to provide proof etc to get her a visa, but any addtl info would be helpful, as well as any other tidbits of info you might find useful. Thank you in advance for your help!" * PROOF from your Automobile Insurance company that you have driven at LEAST five years without an accident. Get that note on their letterhead, signed! You'll need it to get a 'No Claims Discount' from a car insurance company over here. By doing so, you can save up to 70 % on premiums. So don't forget it. * If you bring said charger, but plug converters (see previous blog). They should be available at the airport. You can get them here but I think it'll cost less there. * Bring CLOTHES, especially your good wife. Fashion here is DIFFERENT. It's European! She might not like it (but will hopefully get used to it). And clothing is - in general - less expensive in the US. Anything powered directly by 110 volt. So ditch, store, or give away: your hifi/radio/ boombox /iron/wild hand held mix master that you got for your wedding. Don't bring them because they won't work here UNLESS you buy a Transformer. And you don't want to do that. They are BEAST heavy, expensive, and horrible. I tried it: when I moved here, I brought along what then was a brand new Marantz Hi Fi component system. I LOVED the bloody thing. Then I went out and spent a fortune on a transformer that I couldn't afford. The result? The Marantz was blown within a year, and I had to buy a new system - at extortionate prices. I should have given the thing to my sister then living in California. If I'd left it behind, she'd probably still be using it. Hope that this helps, fellows! Onward! For more advice on living in Ireland, you might consider a purchase of Tom Richards' book, A Survivor's Guide to Living in Ireland. Just click on that link!